Become a certified professional facilitator of LEGO® SERIOUS PLAY® meetings and workshops. We strive to deliver the gold standard of LEGO® SERIOUS PLAY® facilitation training. Graduates of our training seem to agree about this. They report our unique practice-based training gives the skills and confidence to immediately facilitate groups after certification. We train professionals all over the world at some of the world most respected organisations including (and read recommendations from) Google, the LEGO Foundation, IBM, Accenture and the NHS. When we wrote the book SERIOUSWORK, we created this build levels model. Today we base our training on these three levels. The build levels are like a ladder: you learn the levels in turn, as each requires the competency the previous step enables. Enhance communication on any issue. Develop ideas, build trust in teams. Manage staff, set goals, offer feedback. Mentor and coach. Explore, discuss and agree values and behaviours. Unlock individual and group communication and learning on any topic. Create common understanding on shared concerns. Develop shared vision and goals, shared plans, strategies and mental models. Build teams, design new services and innovate. 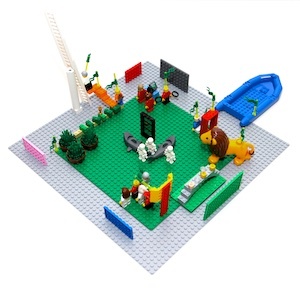 Use LEGO® SERIOUS PLAY® facilitation to create deeper agreement processes. Create and use scenarios to explore dynamic systems and 'real time strategy'. Understand change forces and develop simple guiding principles. Model, analyse and redesign processes and systems. Understand how external and internal factors influence goals. As our book SERIOUSWORK explains Build Level 1 is the foundation and underpins Build Levels 2 and 3. Each level has specific skills that a facilitator requires and most people can learn what they need in a two day training on the core LEGO® SERIOUS PLAY® facilitation skills. If you have opportunities to facilitate Build Level 3, we can teach you advanced skills on your own live projects, which without doubt, is the best way to learn how to facilitate and harness insight from a system model. Since 2010 the LEGO® Group no longer offer LEGO® SERIOUS PLAY® training. As the LEGO website says, you have two options when choosing a training provider. Facilitators training the original method and facilitators training an expanded version of the LEGO® SERIOUS PLAY® method. 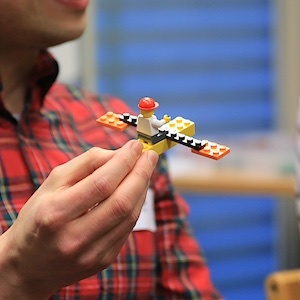 SERIOUSWORK'S unique practice-based facilitation training helps you develop the expanded LEGO® SERIOUS PLAY® facilitation skills LEGO refer too.